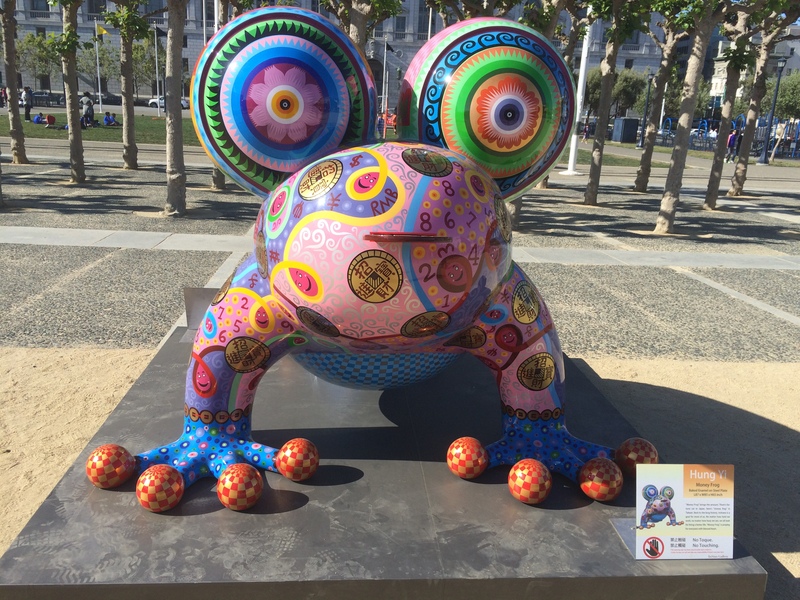 The Money Frog: A potent symbol of Bay Area greed? 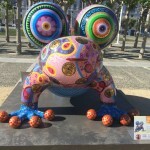 In San Francisco’s Civic Center Park, there is currently an exhibition of colorful-playful animal sculptures by the Taiwanese artist Hung Yi. Every day since moving back to the Bay Area, I have come across coverage of the Bay Area’s increasingly untenable way of life for anyone who isn’t making at least $250,000 a year, from The San Francisco Chronicle reporting on a miniscule apartment selling for well over $400,000 to KQED‘s latest story about the $15 minimum wage. Under the circumstances, Yi’s Money Frog is a potent reminder of just how out of control greed has gotten in The Bay Area. The situation is bad enough for me as someone attempting to move back in San Francisco after a two-year spell away in the much more affordable city of Denver. And, though I’m right at the bottom of the food chain in terms of the real estate market, I’m comparatively well off compared to say, working artists. I chatted with a young professional singer over the weekend about her economic situation. She says she made $19,000 in 2014 from gigs and teaching. She lives in an apartment with her husband, a professional viola player, where they split the rent. It’s affordable, at around $700 a month. But the apartment is in Point Richmond, a fogged in community located 20 miles away from San Francisco. It takes about an hour to commute there. On a good day. The city has to find a way to make life more accessible to people who don’t work for Facebook and Google. Because a city without local art isn’t much worth living in. I recently read that officials in Berlin are putting regulations in place to prevent citizens from renting their apartments out at elevated prices to tourists. Prices in Berlin have been escalating out of control and the city wants to ensure that housing is still affordable for locals. Why can’t San Francisco do something along these lines?